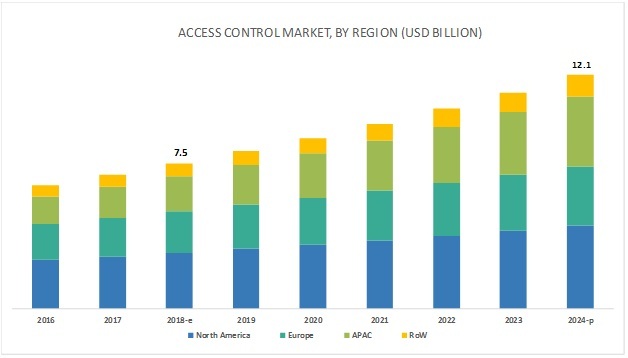 [177 Pages Report] The overall access control market is expected to grow from USD 7.5 billion in 2018 to USD 12.1 billion by 2024, at a CAGR of 8.24% from 2018 to 2024. The growth of the access control market is driven by high adoption of access control solutions owing to increasing crime rates globally; technological advancements and deployment of wireless technology in security systems; and adoption of IoT-based security systems with cloud computing platforms. The adoption of access control as a service (ACaaS); implementation of mobile-based access control; and increasing urbanization in emerging countries are expected to provide huge growth opportunities to market players. Cards are used as credentials to authenticate user identity and determine access grant/denial (also the appropriate level of access). Access control readers can be magnetic stripe, proximity, or smart card readers. Card-based readers are proven to be more reliable than biometric readers and electronic locks. The increasing demand for smart and proximity cards to monitor and record employee activities is one of the drivers for the growth of card-based readers. Smartcards are proven to be more reliable than magnetic stripes and proximity cards. The increasing demand for smart and proximity cards to monitor and record employee activities is one of the drivers for the growth of smart card readers. The access control market in APAC is expected to grow at the highest CAGR during the forecast period. Factors driving the growth of the market in this region include growing industrialization, commercialization, and high demand for security systems. Also, rising terror threats and crime rates in APAC countries and low police officer to population ratio are expected to support the high demand for access control systems in APAC. China accounted for the largest share of the access control market in APAC in 2018. Increased terror threats and growing government spending to enhance security are some of the key factors driving the growth of the access control market. The growing economy of China also creates a significant requirement for security systems. Large population, increasing investments for digitalization, significant R&D, and increasing industrialization in APAC would drive the adoption of security systems. 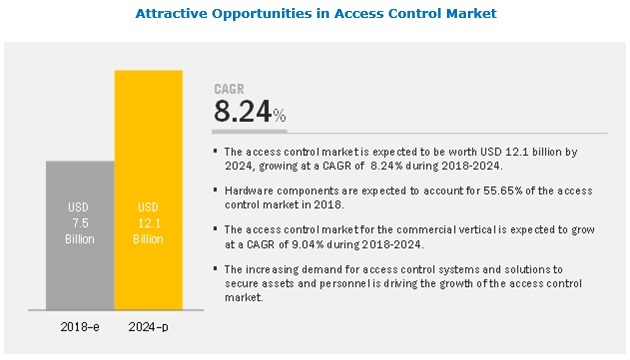 The access control market is currently dominated by ASSA ABLOY AB (Sweden), Johnson Controls International plc (Ireland), dormakaba Holding AG (Switzerland), Allegion plc (Ireland), Honeywell Security Group (US), Identiv, Inc. (US), Nedap N.V. (Netherlands), Suprema HQ Inc. (South Korea), Bosch Security Systems Inc. (US), and Gemalto N.V. (Netherlands). A few of the major strategies adopted by these players to compete in the access control market include product launches and developments, partnerships, and mergers and acquisitions. Other players operating in the access control market are NEC Corporation (Japan), IDEMIA (France), Salto Systems (Spain), Axis Communications (Sweden), Lenel Systems International (US), Time and Data Systems International (UK), AMAG Technology (US), Gunnebo (Sweden), Gallagher Group (New Zealand), Napco security Technologies (US), Kisi Inc. (US), Cansec Systems (Canada), Vanderbilt Industries (US), Adman Technologies (India), and Brivo, Inc. (US). These players have adopted product developments and launches, mergers and acquisitions, and partnerships and collaborations to grow in the access control market. In September 2018, Johnson Controls (Ireland) introduced the C•CURE 9000 v2.70 Service Pack 2 (SP2), one of the industry’s most powerful security management systems, providing 24x7 mission-critical security to people, buildings, and assets. In June 2018, Bosch Security Systems (US) released an enhanced version (3.7) of its access control software, Access Professional Edition (APE). APE 3.7 supports companies in meeting the requirements of the European Union’s General Data Protection Regulation (GDPR). In September 2018, ASSA ABLOY AB (Sweden) acquired Crossmatch (US), one of the leading providers of biometric identity management and secure authentication solutions. This acquisition will enhance ASSA´s position as the world’s one of the leading biometric companies and provides complementary growth opportunities. In September 2017, Identiv, Inc. (US) partnered with Zwipe AS (Norway), a biometric technology company, for access control card formatting services. Identiv’s card service bureau is programming the radio frequency identification (RFID) chips in Zwipe’s biometric credential line, providing all physical access control system (PACS) formats from Identiv’s portfolio. Where will all these developments take the industry in the mid-to-long term? What are the upcoming trends in the access control market? What are the opportunities for existing market players and those planning to enter the market? How inorganic growth strategies would implement by key players impact the growth of the access control market, and who would have the undue advantage? What are the current investment trends in the access control market? 13.2.9 Bosch Security Systems Inc. The study involved 4 major activities in estimating the current size of the access control market. Exhaustive secondary research was done to collect information on the market, peer market, and parent market. The next step was to validate these findings, assumptions, and sizing with industry experts from across the value chain through primary research. Both top-down and bottom-up approaches were employed to estimate the complete market size. After that, market breakdown and data triangulation methods were used to estimate the market sizes of segments and subsegments. 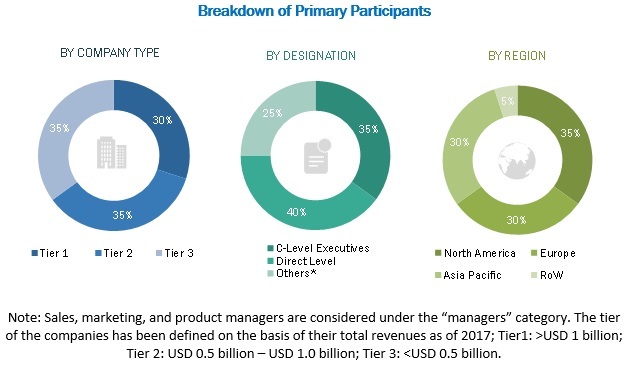 The research methodology used to estimate and forecast the access control market begins with capturing data on revenues of key vendors in the market through secondary research. This study incorporates using extensive secondary sources, directories, and databases such as Hoovers, Bloomberg Businessweek, Factiva, and OneSource to identify and collect information useful for the technical, market-oriented, and commercial study of the access control market. Vendor offerings have also been taken into consideration to determine the market segmentation. This entire research methodology includes studying annual and financial reports of top players, presentations, press releases, journals, paid databases, trade directories, regulatory bodies, and safety standard organizations. The access control market’s supply chain comprises several stakeholders, such as suppliers of standard components, original equipment manufacturers (OEMs), software providers, solutions providers, and system integrators. The supply side is characterized by advancements in access control products and devices and their diverse applications. Various primary sources from both the supply and demand sides of the market were interviewed to obtain qualitative and quantitative information. Following is the breakdown of primary respondents. Key players in major applications and markets were identified through extensive secondary research. After arriving at the overall market size using the estimation processes as explained above the market was split into several segments and subsegments. To complete the overall market engineering process and arrive at the exact statistics of each market segment and subsegment, data triangulation and market breakdown procedures were employed, wherever applicable. The data was triangulated by studying various factors and trends from both the demand and supply sides of card-based readers, biometric readers, multi-technology readers, electronic locks, controllers, and others. This report categorizes the access control market based on Component, Services, Vertical, and Region. What new applications are being explored by access control solution providers?